Pepper's Paws: BlogPaws 2013 - The Adventure Begins! 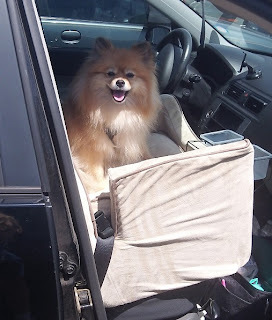 BlogPaws 2013 - The Adventure Begins! I know it is a long car ride because I saw the luggage. BOL! I like trips; there is so much new territory to mark. I drank lots of water, so that I could mark the dog paths at the rest areas really good. When the long car ride was finished, we still weren't finished traveling. We boarded an Amtrak train. Mom really enjoys riding in a sleeper room, and eating in the dining car. 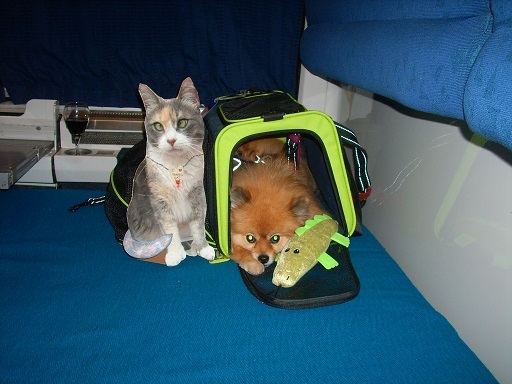 There is a rule on the train: No pets allowed - service dogs only. Time for me to switch to work mode. I have to be quiet on the train. 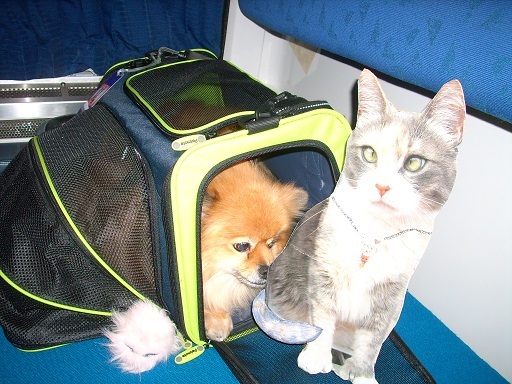 I smuggled my pal @TinyPearlCat aboard the train. I told her to be very quiet. Wait a minute, you don't smell like a kitty! I've been tricked! This is Flat Pearl. I wonder if the no pets rule applies to Flats. At least she won't need a litter box. BOL! I was a little worried because I didn't pack one. When our train ride was finished, I could see Emmy! We must be at BlogPaws!! I hope we can fit all of our luggage into Emmy's car. BOL! This year BlogPaws is in Tyson's Corner, VA. It is near Washington, DC. There are many famous places to see and sniff. At Union Station I could see the Liberty Bell. The white building peeking through the trees is the Capitol. In our hotel room, Emmy introduced me to Charlotte. Charlotte lives with Emmy. I was nice to Charlotte, and I didn't try to chase her. I have a MilkOpet beard! BOL!! Emmy, Mom, Rocco, Rocco's mom, and I went to visit the Chrysalis vineyard on Wednesday afternoon. 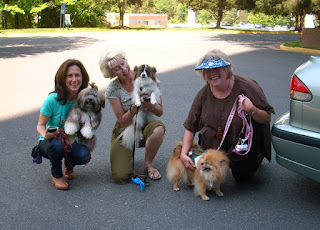 I posed for a photo with my pals Rocco, Oliver, and Emmy before we went to the vineyard. We were tired and ready for bed when we returned to the hotel. Woof, my yapper is tired. I'll bark more about BlogPaws soon. 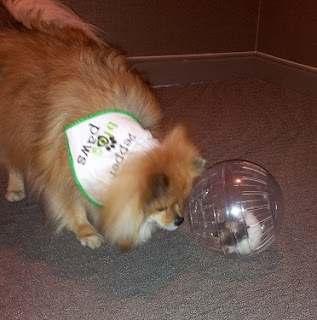 Loved seeing you at Blogpaws! 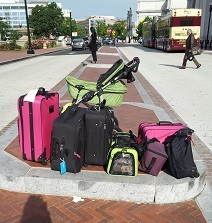 That sure is a lot of luggage. Glad Emmy could fit it in her car. I loved seeing you too!! I'm glad it all fit too! BOL!! I thought I was going to need a taxi just for the luggage. BOL!! 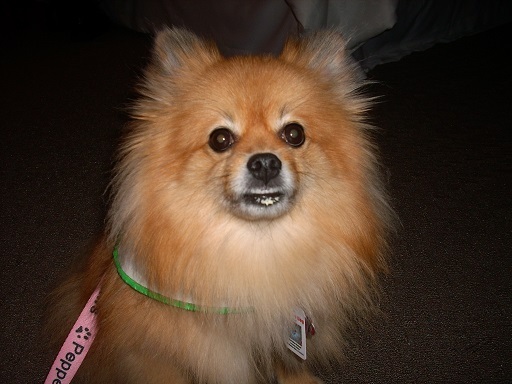 Pepper you were one of the FIRST doggies I met at BlogPaws! I was soooooooo excited! Your Mom is as sweet and beautiful as you are too! Hugs!! I was excited to meet you too! Mom still laughs at how I stopped in my tracks and pulled her straight to you. BOL!! HI Panky! I was so happy to see you too! BOL!! See, Mom was serious about the luggage. BOL!! Sneaking on the train, huh? My dogs would never get away with that. ;) BTW, I love your pet car seat! BOL!! I didn't sneak on. I was there because I am a service dog. Flat Pearl is the one who we sneaked on. BOL!!! OMD!! That looks like it was quite the adventure Pepper!! 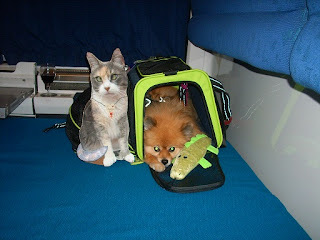 Wows, it looks like you had a FABulous time, and met all kinds for furends!! I've never tried that Milk stuffs...sounds delish!! What a great post! I was so happy to finally see you that I think I forgot to introduce myself to your Mama! You are such a beautiful girl! Sending you hugs and kisses! TW and Plush CK were so excited to meet you. We didn't know any of the other woofies there. TW said your Mom is separated at birth from a dear friend of hers who's a vet tech and works with shelter pets down in Baton Rouge. Oh Pepper it looks like you had such an amazing time! Lucky you getting to ride on the train. I haven't been on a train in a very long time now. 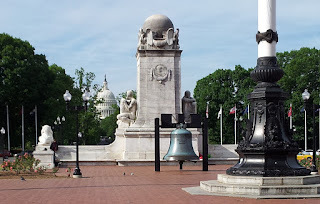 You certainly are getting to see a lot of things in your travel the Liberty Bell did you get a chance to swing by Washington DC and see those sights. I thought your cat was real when first looking at it till you mentioned it was flat kitty and you were tricked. Your pals Rocco and Emmy looks really nice. I bet you were totally exhausted after that wonderful trip. Ooh, Pepper...brilliant idea with the MilkOpet! It looks like it was a fabulous trip!!!! I cannot wait to hear all about it. Okay, tell the truth, Pepper. How much of that luggage was your Mom's and how much of it was yours? Somehow I bet a large portion of it was yours! BOL So glad you had a wonderful time. Oh Pepper - you were such a good dog at Blog Paws! It was good to see you again! I love Pepperspaws! I love Poms, they are like children. My 2 are my babies. I loved your blog.